Which are the best 3 reel slots at Palace of Chance? As the number 1 US choice for online gamblers everywhere, Palace of Chance has always made sure to cater to the preferences of our many loyal customers. For some clients, that usually means modern 5 reel slots and innovative table games, but other customers like to roll in a more classic flair, which is the reason why they love our exciting three reel slots. Bonkers: Many clients are joyfully mad about this colorful slot, which never fails to keep the clients happy with its simple but highly rewarding style of play. Bonkers is one of the oldest slot machines in Vegas and this online version replicates it to last detail, even using the same symbols as the original machine. 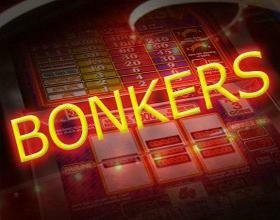 The reason why Bonkers is so timelessly popular is its fast play combined with its many free spins. Such features make sure you never get bored while playing this one reel masterpiece. As a special tip, always be on the lookout for the Bonkers symbol, because 2 or 3 of them will immediately grant you the crazily delightful high paying free spins! The game also includes an over-the-top progressive jackpot that can be hit when you play three coins and score three 7s on the payline! No wonder our players are crazy about this mind-blowing slot! Pharaoh’s Gold: The golden times of ancient Egypt were epochs of exquisite wealth and insurmountable development where gold flowed as copiously as the waters of the Nile. In this 3 reel game, the pharaoh is feeling plentiful and wants to share his wealth with you with three different paylines. One of the most dazzling features about this slot machine has to be its unique design. All of the symbols are inspired by authentic Egyptian imagery like the eye of Horus, the ankh and, of course, the magnificent Pharaoh. 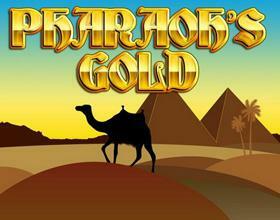 So can you play only one line at Pharaoh’s gold? Of course! Depending on how many coins you deposit, that is going to be the amount of lines you get to play: 1 coin equals 1 line, 2 coins equal 2 lines, and 3 coins get you action on all three lines. As an extra perk, the eye of Horus is a wild symbol that will replace other symbols to help you score paying combinations faster! 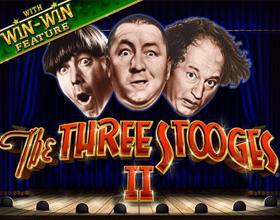 Three Stooges II: Who doesn’t love the Stooges? Their crazy antics have delighted audiences for more than 50 years and continue to form a cult following as time advances. You do not get any better than Moe, Larry and Curly if you are on the look for tons of laughs. In Palace of Chance, we wanted to pay homage to such an illustriously disastrous trio, so we have this wonderful 3 payline 3 reel slot that is a veritable cackle and chip fest. It even includes funny little clips of the Stooges to keep you chuckling as you increase that chip count! The logo of the game helps you multiply your winnings by substituting symbols with the exception of the three scatters. The Three Stooges work like scatter symbols: When you get three of the same one a payline, you have access to different bonus rounds that give you tons of free spins! If you get all three different Stooges on a payline, be ready to dance like Curly all the way to the bank because you will immediately win our sensational progressive jackpot! Oh boy! That sounds “Poifect”! Sure enough, cool things never go out of style! Be sure to give these 3 reel wonders a chance the next time you visit us here at Palace of Chance!